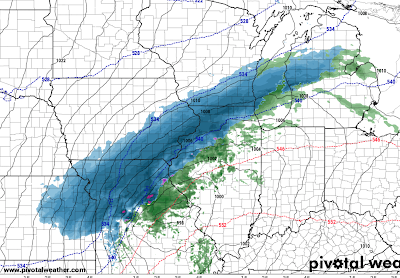 This storm will be sufficiently serious you may wish to alter your plans if you are changing planes in Chicago or Milwaukee or driving through the area where the winter storm is forecast to occur. Let's begin with an overview. 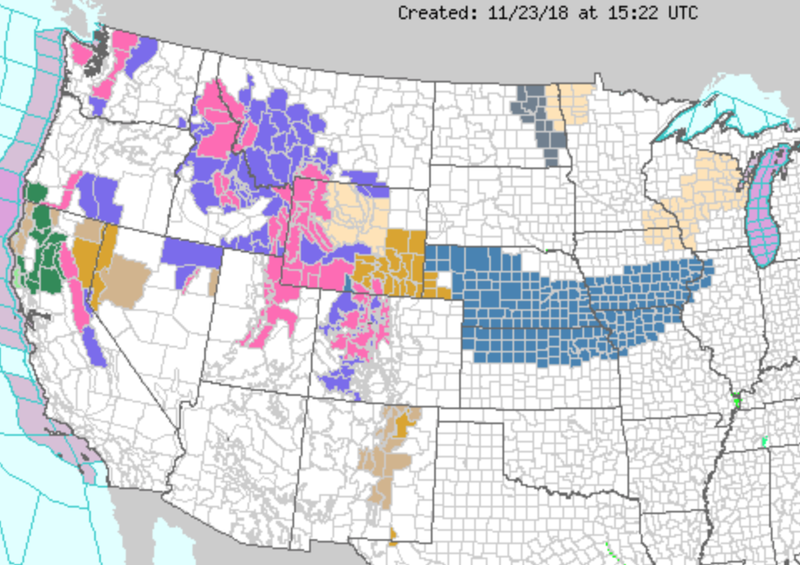 In the West, winter storm conditions are expected today and tonight. The green in Northern California and far southwest Oregon are flood watches. 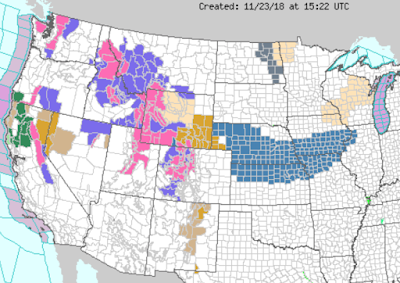 If you are traveling by car in the Midwest or Great Plains on Sunday, you may want to reconsider your plans. Not only will there be heavy snow, there will be high winds that will cause drifting and extremely hazardous road conditions. The maps below are for planning purposes. 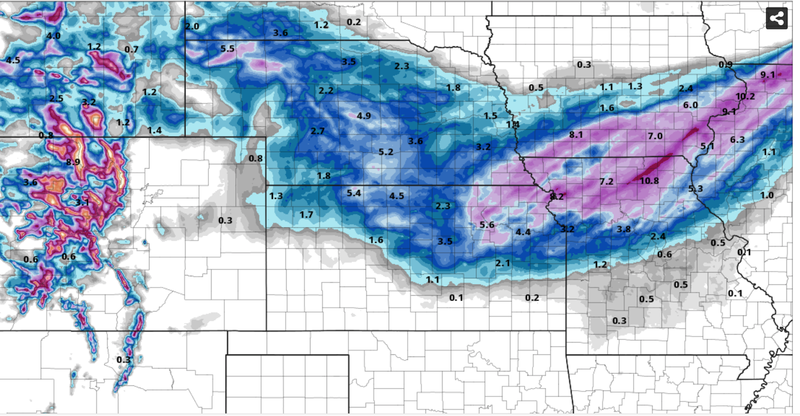 The snow amounts, at this point, are approximations. 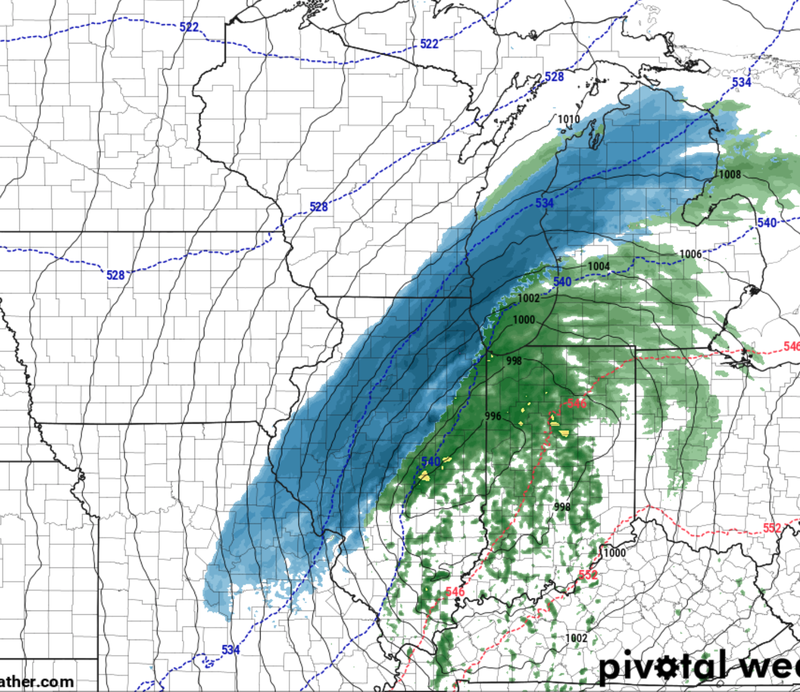 At 9pm CST Saturday, extremely heavy snow (great for skiers!) 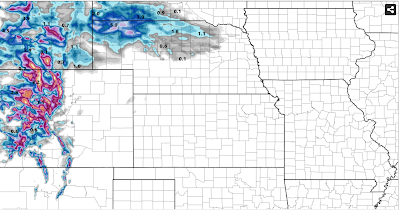 will have fallen in the Rockies with accumulating snow beginning to move from Wyoming into the Nebraska Sandhills. I-70 in Colorado and I-80 in Wyoming will be a mess. Below is the forecast radar for 4am Sunday. 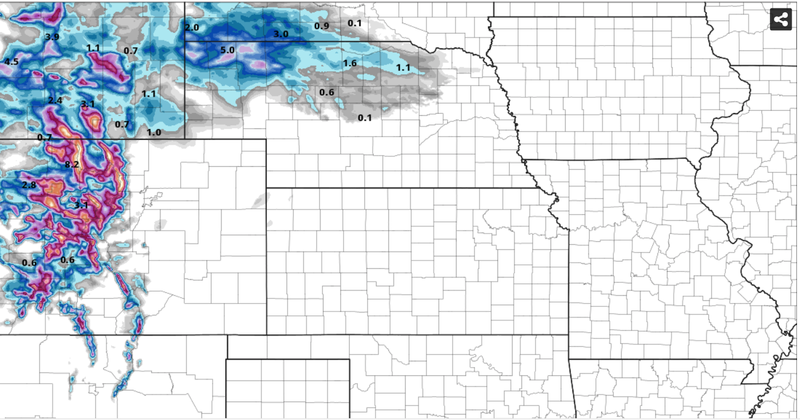 Blue is snow and darker blue equals heavier rates of snowfall. The storm will begin to intensify rapidly at this point. Here are the forecast accumulations at 4am Sunday. 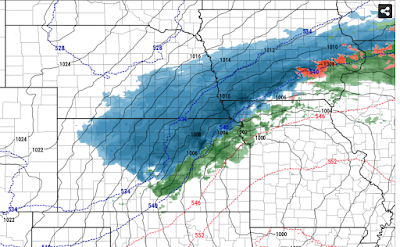 This is the forecast radar for 1pm Sunday. Winds will be gusting to 30-35 mph from eastern Kansas to the Mississippi River. 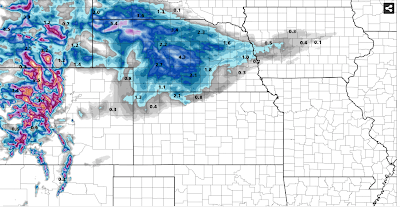 At 7pm Sunday, heavy snow will have fallen from northeast Kansas to Chicago. The airline hubs at Chicago and Milwaukee will be a mess on Sunday, especially in the afternoon and evening. Travel along Interstates 70, 29, 80, 35, 88 and 90/94 will be hazardous to nearly impossible due to the high winds that will accompany the snow. The winds will be high enough to qualify for near-blizzard conditions. Below is the forecast radar for 7pm Sunday. The high winds will have moved into Illinois and Missouri. Finally, the map below is the forecast accumulations as of 7pm Sunday. 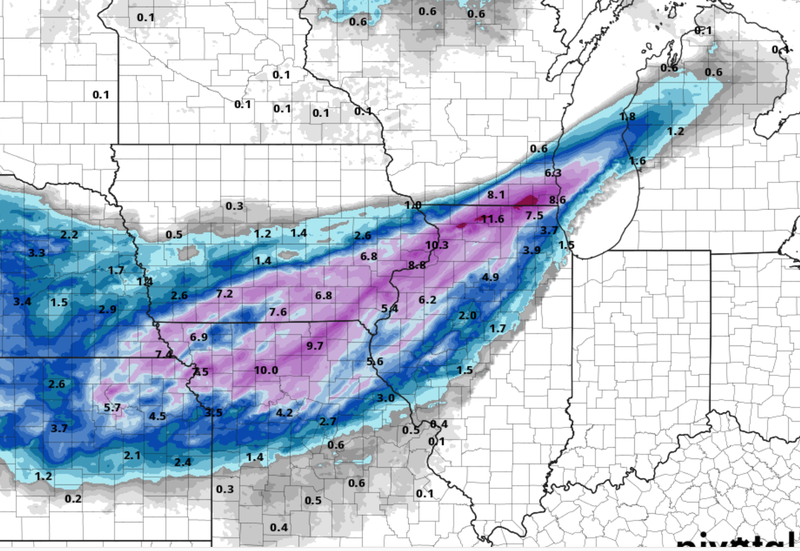 Some areas will have nearly a foot with considerable drifting. While there is uncertainty as to the amounts and exact locations, I am highly confident a major storm will occur and I am confident as to the timing. I recommend considering altering your plans if you are planning to travel though this area Sunday or Sunday night. 40th Anniversary of "Turkeys Away"
Global Warming: Is There Anything It Can't Do???? Sunday Fun: I'd Say So! What Is Wichita Like As a Place to Visit? Sunday Fun: Sacrificing to Save the Planet!! Kill Fido To Stop Global Warming! You Say No One Wants a Revolution? ?